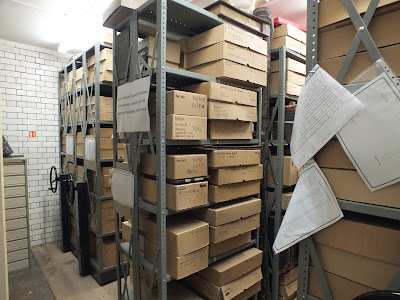 There was a chance to look behind the scenes at Leigh Archives this week, when the basement of the Town Hall was open as part of Heritage Open Days. 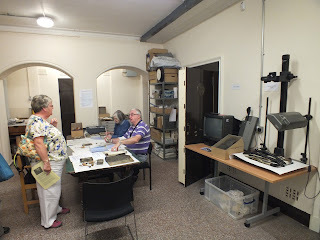 Alex Miller, the archivist, aided by a team of volunteers, is clearly doing a fine job in conserving the collection and making it more accessible. On show was a good example of this work—Quarter Session records, which were stored in rolls in an attic for many years prior to their acquisition. No detailed catalogue of these records exists and the outer layers of the rolls are coated in a thick layer of soot and dirt, rendering them unreadable. Each roll is now being separated into individual documents which are cleaned, pressed flat and catalogued. The strongrooms in which the collection is held were also open to view. Some years ago there were rumours about the state of these areas which caused concern. However, as you can see from the photograph above, they now appear clean, dry and orderly. All in all a very positive occasion which demonstrated what an enthusiastic archivist can achieve, even with a woefully inadequate budget. For details of the usual arrangements for access to the archives, see the Wigan Heritage Services website.